The Teddy Bag, designed by François Verez and Ane Eguiguren, is one of seven finalists of the INDEX: Design Challenge, Designing for Education, the objective of which was to propose solutions to improve education in the developing countries' schools. Teddy Bag is a school bag that turns into a desk. It allows children to carry all the items they need for school and then study on the spot, anytime, anywhere. Because it's made from cardboard, it's lightweight and easy for kids to carry. Plus, the simple production process makes it possible to be produced easily in developing countries. The Teddy Bag, designed by François Verez and Ane Eguiguren, is one of seven finalists of the INDEX: Design Challenge, Designing for Education, the objective of which was to propose solutions to improve education in the developing countries’ schools. Teddy Bag is a school bag that turns into a desk. It allows children to carry all the items they need for school and then study on the spot, anytime, anywhere. 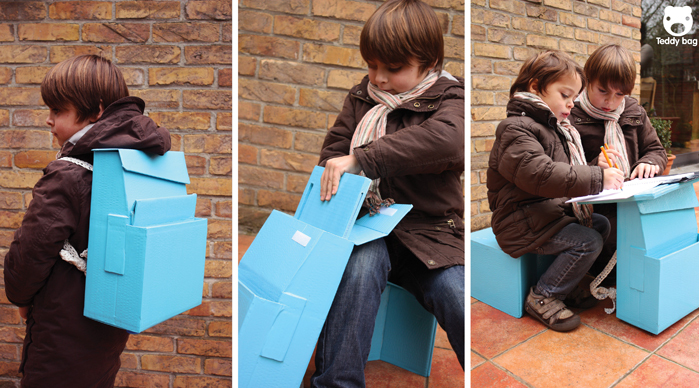 Because it’s made from cardboard, it’s lightweight and easy for kids to carry. Plus, the simple production process makes it possible to be produced easily in developing countries. The Teddy Bag was designed as a school furniture concept for developing countries. It's a school bag that turns into a desk. Since it's constructed from cardboard, it's lightweight enough for kids to tote and it ensures a simple production process making it possible to produce the bag-desk hybrid in developing countries. The design allows kids to carry all of what they need to study -- including the desk to study at -- so they can hit the books in school, at home, anytime, anywhere. The handles of the backpack are made from repurposed plastic bags that are cut into long thread-like pieces and then knitted together to form a mesh. The design duo Francois Verez and Ane Eguiguren used repurposed cardboard boxes as the basis for the backpack, drawing their plan right on the cardboard. The school bag has enough space to carry the table and some school -- as much as a 3-ring binder and a few books. The desk can easily resist up to 60kg. The Teddy Bag is painted and varnished to make it water resistant and more practical for carrying in many weather conditions.